Easy enough to install and looks great. I watched a lot of videos on how to apply the screen protector and although it seems difficult to do, the quality is worth the price. What else can I say except White Dome is the best screen protector on the market. Fits perfectly with every case. And the touch sensitivity is amazing. I have already bought 4. Only downside is all the plastic that comes with the product (UV light, cable, plastic frame, etc) which I end up throwing away as I have no use for it, wish they could sell just the screen protector and glue. Also if you take too long to set the glue, it will become clumpy on the sides. Overall this is the only product if you want to protect your expensive phone. Installation process takes some time but is easy and worth the patience. The provided alignment tray ensures a perfect fitment, other screen protectors don't come close to the quality of the Whitestone dome glass. Screen responsiveness and clarity is not affected by the protector, and works great with most phone cases, would definitely purchase again if needed. Quality is very good, installation is a little harder than I originally thought. Be sure to watch installation video multiple times to get it done right. This is the absolute best screen saver. You need to make sure you install on a level surface and delivery may take 2 weeks but this is the cheapest price I found. The product was exactly what I ordered and I'm completely satisfied!!!???? Great product, more advanced than competition. This screen protector is the one to get if you have an s9 due to how well it conforms to the phone's curved display. Installation is much easier if you watch the the installation video on YouTube, but it's not difficult buy any means, just tedious. The protector also works perfect with my Otterbox symmetry case. The greatest thing about this product is that I don't even notice it's there. Purchased the protector for my S9. It came and during the install the UV light failed and prevented me from curing the adhesive. Mobilefun sent me a new kit after i contacted them. Second Kit arrived and after the first install attempt there was a very small bubble in the center of the screen with no debris underneath. Removed the protector and cleaned it with alcohol. Second attempt came out fine but after 30minutes bubbles started to appear on the left edge of the protector and moved vertically up the edge. I followed the instructions in the box and used the mobilefun youtube video for reference. The rest of the protector fits perfectly on the screen and looks good. Installation worked perfectly, no bubbles or dust under the glass. I followed the instuctions to the letter after watching the video several times first. Protector fits the screen seamlessly including the curved edge and doesn't interfere with an official Samsung back case. Well worth the extra cost compare to other protectors, you hardly notice it's on the phone. You get 2 tries to fit temper glass cover, every time I got an air bubble in the middle, that i couldn't get rid of. Sorry to hear you had problems with the application of the screen protector. you get two viles of the glue in each pack so as long as you haven't cured the glue with the UV lamp, you can try the application process again. Also please make sure you apply the screen protector on a perfectly flat surface so the glue spreads evenly over the surface of the screen. Hope this helps and don't forget to watch the video too for extra tips and advice. This does not fit the rounded Edge of the S9 leading to it cracking within two weeks of applying. I just bought a new Galaxy S9 and wanted to protect my investment. 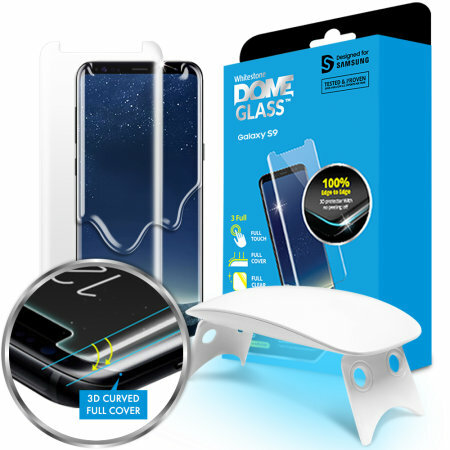 I searched the various recommendations for "screen protectors" and decided on Dome Glass. Then I narrowed my choice down to vendors, and I decided on Mobile Fun (out of Britain). They had the best price and service, from what I could tell. I got my Dome Glass about a week later, and I applied it per the Youtube video instructions. So far, it's working great. I was not able to fit it and had to throw it away. I have done several screen protectors before but this one was very complex. Instructions are poor and in 5 point so I needed a magnifying glass to read them. I could not get the glue to cover the whole screen before curing with UV light. Avoid unless you are very good at this!! Sorry to hear you had problems. Did you watch the instruction video? We highly recommend this before any application is attempted. Please contact our Customer Services team if you require further assistance. Great quality. Not very difficult installation. well what can i say for the price is it worth it well i would have to say yes ..would be nice to have to glass parts for the price but still yes its worth it ..some people but 800 pounds phones and then stick 10 screen protectors on them so i dont see the point ..u have a s7 and also bought myself tempered glass screen protector for that does it work yes it went on great yes it was way cheaper than this ..but here is the difference it will no doubt pop of soon and i have to press just that little bit harder to type . I would recommend this screen protector to anyone with a S9. It is easy to install by following the video guide and fits the phone perfectly. Feels like original screen. Full cover. Easy installation. No bubbles. Perfection. Had a very slight problem when I put the screen protector on the jig at the bottom end first kind of kept it from sitting properly flat & left some very tiny air bubbles at the 2 jig positions at the bottom, contacted mobilefun totally sorted the situation out for me great company & will certainly buy again from them, but don’t be deterred from the product it’s great. Yes it has a higher price than the other screen protectors on the market but it's worth it! My first thoughts were that the product was overpriced for a screen protector, then i thought to my self how many cheap protectors I have purchased in the past that haven't fitted properly or peeled off. I have properly spent a small fortune. So after watching a few install videos I decided to take the plunge and purchase the Whitestone Dome for my Galaxy S9. I am absolutely delighted with this product. When I opened the box and looked at all the components I did panic a little bit, but it is very easy to install and looks perfect. Just make sure that you watch plenty of install videos and also watch the installs that went wrong. I bought 2 of these in the end so its not been cheap, and it's still not on in the best possible way. The guard still let the cover slip a touch so even though it's a couple mm out the case is sitting on it which is making it sweat and it's starting to lift. Nearly £80 spent so not best pleased. I was initially quit daunted when presented with the box contents. However, after watching the video and reading the instructions, it was quite straight forward and the screen cover went on successfully on the first go. Screen cover works great, looks very nice. Liquid is a little tricky, I have put on several screen covers, none quite like this one, this one is great and should last a long time. Installation was easy and after using it for a week or just over I would say the protector is by far the best I ever used. Expensive but I think worth the cash. Hope it hold up in a crash test, should it need to ;) The glass performs amazingly well, no sensitivity loss and clarity is incredible. Amazing protector, easy instalation and best quality. Most important.... you don't loose screen sensitivity. The glass protector is excellent and works perfectly. The application process is quite complex and is easy to not get it right perfectly. I'm left with a top left corner that is not sticking well and 2 small bubbles that are almost imperceptible. After 3 attempts. I took the first one off and brought another one to try perfection and still failed. Removing the glass is easy and very clean. No residue left on the phone. I've always had someone install a tempered glass protector for me as I'm useless at it, and they have always been the protectors that have the adhesive already on the back. This setup was almost too easy, and has a finish that looks like it has been factory installed. The time you take to install it is worth it. Definitely send your money on this and don't consider anything else. At first I thought this product was a little pricey but being that you pay for what you get I thought I'd give it a go anyway ... honestly never had such a good fit to any of my phone's the instructions are simple and easy to follow resulting in a completely bubble free and perfect fit fully recommend and will be buying again should i ever need too! Money well spent. Bought this for my s9. Had this also for my note 8. Didnt go for other glass protectors as it affected touch sensitivity. This product is the best as the glass is glued all over. You just need to watch the video installation a couple of times to be confident. I messed up the first try but followed instructions on how to re apply and worked out well. Price is high but certainly the best out there. Recently purchased for Galaxy S9. A little technical installing it for a screen protector but worth every Penny as I have found out. This protector is brilliant.Looks great on the S9.Follow instructions and take your time putting it on.I would recommend it.Its not cheap, but worth it. This is an excellent screen protector which fits the S9 perfectly and still allows you to fit a Samsung case. I would recommend that you watch the video two or three times so that you can fully grasp the timings of each phase of the installation. It gives you a bubble free protector that still allows full use of the touch screen (the sensitivity of the screen can be adjusted in settings). The only small problem was with the ultra-violet light, which turned itself off after 30 seconds and for the final stage it has to be on for 60 seconds, but it can be quickly turned back on again. Overall an excellent piece of kit. This product looks great on my new S9 and was relatively easy to fit.